Saw this beautiful fountain while visiting the NY Botnical Garden in the Bronx. Apparently I misunderstood. 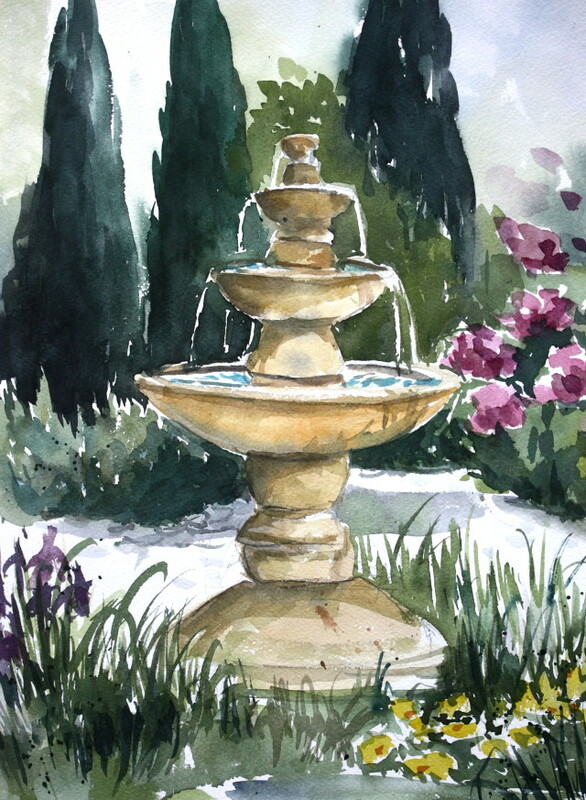 I certainly have plenty of photos of other fountains I could have painted. I sure have a deeper appreciation for the "real masterpiece" now! This church, in Bolivia, afforded an opportunity for very chromatic darks, loosely painted, an architectural theme but very much light, not objects. W/C paper has been prepared by first painting over it with gesso. I then sand it a little and paint a coat of gel that has been thinned with water. The paper now acts almost like yupo. 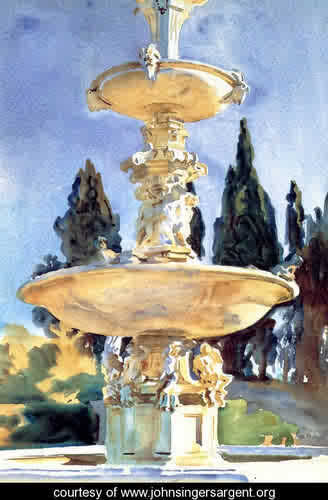 I love John Singer Sargent's whites. They are full of color. 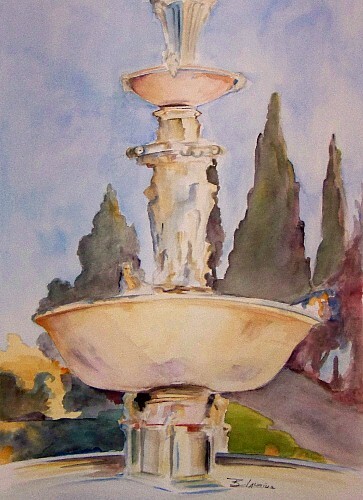 14 3/8" x 18 1/2"
This fountain by French sculptor Frederic Bartholdi, who is also the author of the Statue of Liberty (NYC), was originally intended for the city of Bordeaux and was finally bought by the city of Lyon, where it can be seen Place des Terreaux. 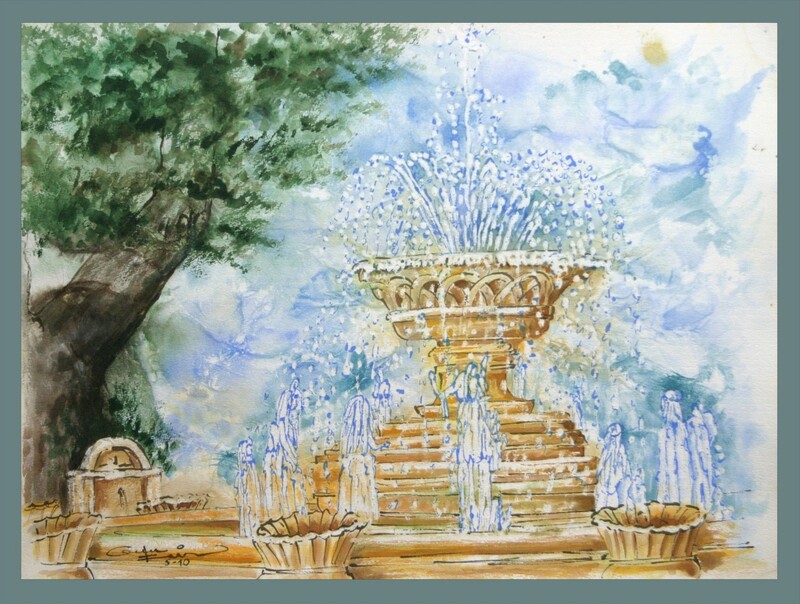 It is not to be confused with the "Bartholdi Fountain" by the same sculptor, which can be seen in Washington DC. 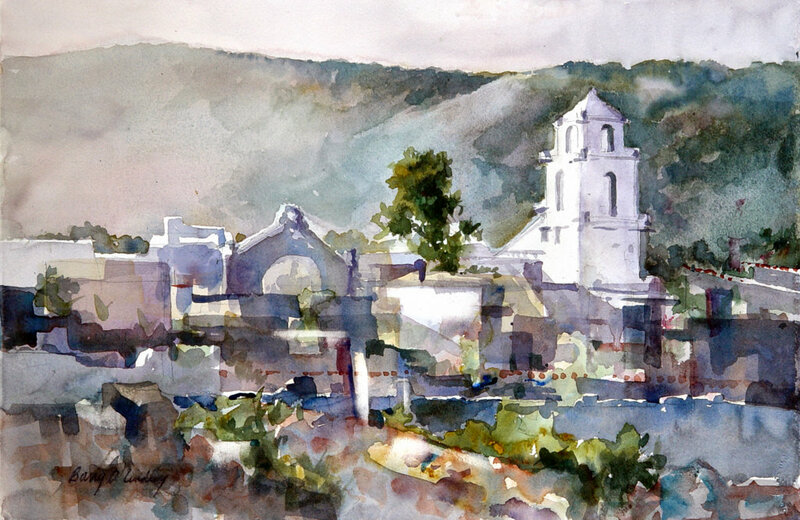 At first I tried to copy the painting of John Singer Sargent and experienced a lot of difficulties. 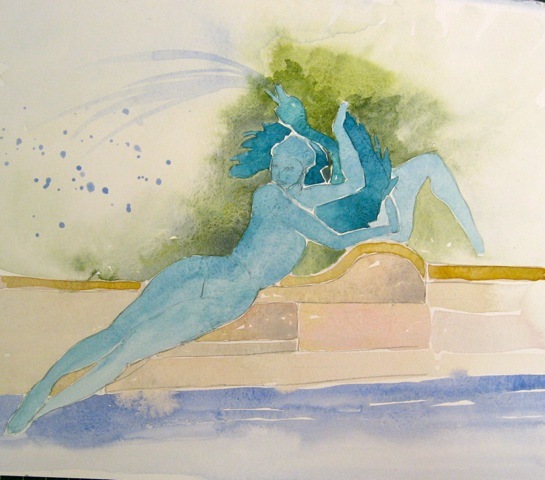 So I found a photo of this fountain in the internet(www.statue.com/images/estate-fountain.jpg)I hope with publishing the source of my image I don't violate copyright. 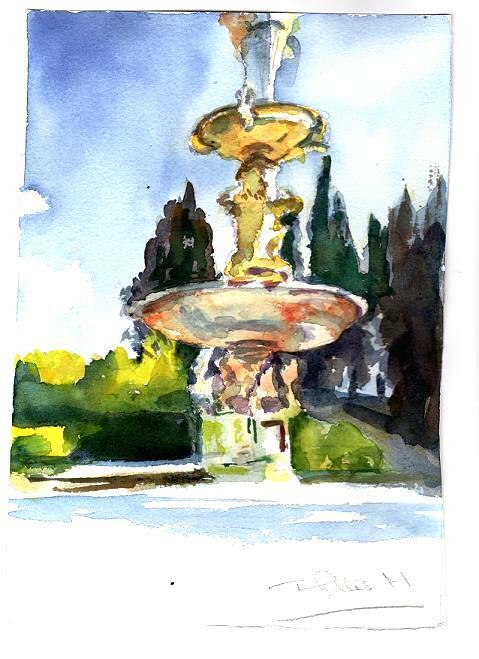 I studied the paintings of Sargent, found a reference photograph of a fountain on Wet Canvas, and attempted to do my "Sargent" painting. I failed - it is almost totally in my style - I tried! The Swann Memorial Fountain is located on Logan Circle in Philadelphia, PA. Years ago,I worked at the Natural History Museum just across the Parkway from this treasure and spent many enjoyable hours admiring it. Trying to emulate Sargeant in doing this small vignette proved to be a lesson in what a true master he was. 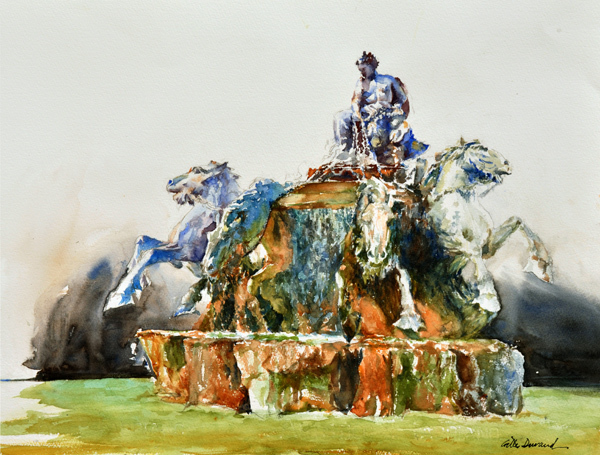 I think I'll try again, this time including the entire fountain. 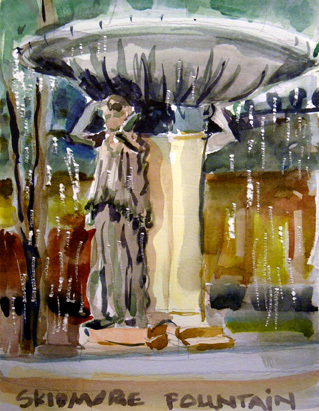 My attempt at painting "Sargents Fountain"
This is a fountain here in Katerini, North Greece, in a square called "Fountain's Square". 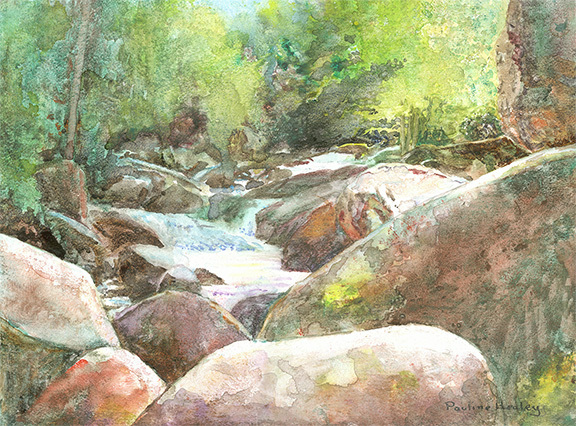 I just finish my painting, an inspiration after Sargeant, and name it, "The Pierian Muses".Wet on wet with ink.